……a nice change of pace. It’s taken me a while to decide what to do with the space in front of our front porch. It’s been half done for a few years now. At least it seems that way to me. I just haven’t been able to zero in on what I like for that area. Well, I think I finally did it. At least I like the way it has turned out. I may change it again in a few years, who knows? But that’s what’s fun about gardening. 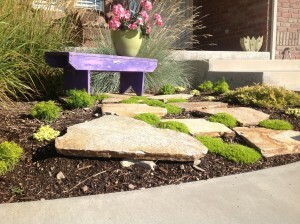 All of the hardscape stuff in this picture has been re-purposed, even the flagstone. We have moved that all over the yard. The green pot/vase, whatever, has been used here and there as well. Secret: the geranium in the pot is fake……ssssshhhhh. I never use fake stuff outside, but we’ve had such harsh climate conditions the last couple years it’s really been hard to know what to plant. Single digits in the winter and triple digits in the summer! What’s up? There is no way I could keep a plant alive in a small pot like that in those conditions. And it’s really been fun to have that pop of color on that bench. I’m not even ashamed. And NO DEADHEADING. Yay! 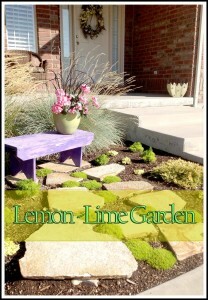 What I really like about this space is the lemon-lime color of it all. The scotch moss (which is one of the mosses that does very well in the sun) and other little plant that I can’t for the life of me remember the name. It starts with an “S”. And the lemon creeping thyme. These are all perennials and I’ll let you know next year how they winter over. Then the yellow tam is a golden tipped spreading evergreen. It will only get about 3 feet in diameter and about 6 inches tall, just right for that space. 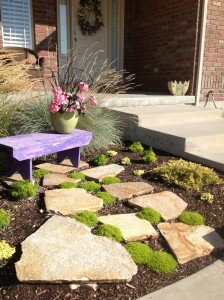 The moss should fill in between the flagstone really well next year. 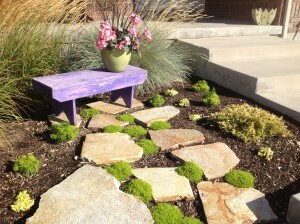 Between the purple bench, the green pot, the pink fake geranium, and the lemon-limes of the plants it produced a nice cool color palette and is a refreshing respite in spite of the triple digit summer heat.